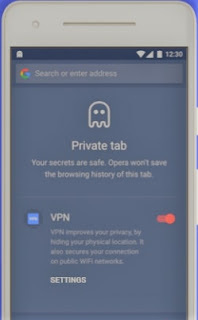 Home / Android / tech / Opera's No log VPN is coming to Android..
Opera's No log VPN is coming to Android..
After Opera's VPN powered PC browser became success, the company now announced its going to release its no log VPN powered browser for Android platform too. If you don't know what that exactly is VPN feature is, don't worry! Relax.! VPN is nothing but Virtual Private Network, to say in simple words,i would say, this is the feature that will fake your IP address, its like browsing from some other another location while your location is different. For example: If you are based out in United states, and if you turn on the VPN Option Selecting Server based on United Kingdom, then the website that you are visiting will consider you are actually based on a different country, in our case United Kingdom and will provide content based on the location preference. This feature is used for better privacy protection. Using this feature you can Skip "ISP's blocks (Accessing Website blocked on your country), and website tracking based on the location"
So, in additional to the existing browser features like ad-free browsing, Opera is adding this feature to its existing browser. But right now, since its currently under development phase, the company says, this feature will be rolled out to beta users first, and then it will be released on stable versions. You can download the beta version of Opera at https://opr.as/app-d1f8f directly from Play store..
Logesh February 09, 2019 Let me Share my thoughts!